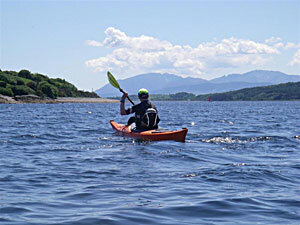 Saturday saw us out on a paddle from Colintraive to Tighnabruaich. The weather was sublime and it was easy to imagine that we’d relocated to a tropical idyll. It’s the first time I’ve approached Tighnabruaich by sea, and it was all the more special that it was in my own wee boat. There was a fair blast of wind on the way back and I did tire from battling it. But it was worth the effort just to be out on the water on a perfect summer’s day. I have to mention something that has really helped me progress with my paddling. Earlier in the year I developed a very sore wrist whilst out on a day trip, to the extent that I had to swap paddles with Alan. He had a crank-shaft paddle and using it allowed me to get back (which I had started to doubt was possible, such was the pain). I had a carbon (straight) shaft Lendal Archipelago paddle before. I have since upgraded to the same kind as Alan’s – Lendal Kinetic Touring carbon crank-shaft with polymer blades. What a difference! So comfortable to use and my paddling is much more efficient now, to the extent that I no longer lag quite as far behind Alan. I feel like I get a lot more power out of my stroke and it’s made kayaking a great deal more fun as a result. It’s a shame that Lendal are no longer resident in Scotland, having been bought over by US company, Johnson Outdoors, and relocated to the US. I feel pleased that my paddle was manufactured here, but it was one of the last. Addendum: I have since learned that ideally I should have purchased Kinetic Touring-S blades, designed for the smaller paddler, as the larger blades require more strength. Alas, it is too late now as the money has been spent and I can’t swap in blades. These are the pitfalls of shopping for kit as a (smallish) novice.